•Clinical Supervision and Professional Development of the Substance Abuse Counselor, Part 1. •Clinical Supervision and Professional Development of the Substance Abuse Counselor: An Implementation Guide for Administrators, Part 2. •Clinical Supervision and Professional Development of the Substance Abuse Counselor: A Review of the Literature, Part 3. Parts 1 and 2 are presented in this publication; Part 3 is available only online at http://www.kap.samhsa.gov. •Central principles of clinical supervision and guidelines for new supervisors, including the functions of a clinical supervisor. •The developmental levels of counselors and clinical supervisors. •Information on cultural competence, ethical and legal issues such as direct and vicarious liability, dual relationships and boundary issues, informed consent, confidentiality, and supervisor ethics. •Information about monitoring clinical performance of counselors, the various methods commonly used for observing counselors, the methods and techniques of supervision and administrative supervision, and practical issues such as balancing one’s clinical and administrative duties, finding the time to do clinical supervision, documentation, and structuring clinical supervision sessions. •Representative vignettes of clinical supervision scenarios. •Master supervisor notes and comments that help you understand the thinking behind the supervisor’s approach in each vignette. •“How-to” descriptions of specific techniques. It is strongly recommended that you read chapter 1 before reading chapter 2. Part 2 is an implementation guide for program administrators and consists of two chapters. Chapter 1 lays out the rationale for the approach taken in chapter 2 and will help administrators understand the benefits and rationale behind providing clinical supervision for their program’s substance abuse counselors. Chapter 2 provides tools for making the tasks associated with implementing a clinical supervision system easier. •How to develop a model for clinical supervision and implement a clinical supervision program. •Key issues for administrators to consider, including assessing organizational structure and readiness. •Legal and ethical issues to consider. •Providing professional development for clinical supervisors. Part 3 of this TIP is a literature review on the topic of clinical supervision and is available for use by clinical supervisors, interested counselors, and administrators. Part 3 consists of three sections: an analysis of the available literature, an annotated bibliography of the literature most central to the topic, and a bibliography of other available literature. It includes literature that addresses both clinical and administrative concerns. To facilitate ongoing updates (which will be performed every 6 months for up to 5 years from first publication), the literature review will be available only online at http://www.kap.samhsa.gov. American Psychological Association to sponsor continuing education for psychologists - www.psychceu.com maintains responsibility for this program and its content. •To discuss the central principles of clinical supervision and guidelines for new supervisors, including the functions of a clinical supervisor in the substance abuse treatment field. •To assess the developmental levels of counselors and clinical supervisors. •To describe cultural competence, ethical and legal issues such as direct and vicarious liability, dual relationships and boundary issues, informed consent, confidentiality, and supervisor ethics. •To demonstrate practical issues such as balancing one’s clinical and administrative duties, finding the time to do clinical supervision, documentation, and structuring clinical supervision sessions. Clinical supervision is emerging as the crucible in which counselors acquire knowledge and skills for the substance abuse treatment profession, providing a bridge between the classroom and the clinic. Supervision is necessary in the substance abuse treatment field to improve client care, develop the professionalism of clinical personnel, and impart and maintain ethical standards in the field. In recent years, especially in the substance abuse field, clinical supervision has become the cornerstone of quality improvement and assurance. Your role and skill set as a clinical supervisor are distinct from those of counselor and administrator. Quality clinical supervision is founded on a positive supervisor–supervisee relationship that promotes client welfare and the professional development of the supervisee. You are a teacher, coach, consultant, mentor, evaluator, and administrator; you provide support, encouragement, and education to staff while addressing an array of psychological, interpersonal, physical, and spiritual issues of clients. Ultimately, effective clinical supervision ensures that clients are competently served. Supervision ensures that counselors continue to increase their skills, which in turn increases treatment effectiveness, client retention, and staff satisfaction. The clinical supervisor also serves as liaison between administrative and clinical staff. This TIP focuses primarily on the teaching, coaching, consulting, and mentoring functions of clinical supervisors. Supervision, like substance abuse counseling, is a profession in its own right, with its own theories, practices, and standards. The profession requires knowledgeable, competent, and skillful individuals who are appropriately credentialed both as counselors and supervisors. Clinical Supervisors (TAP 21-A; CSAT, 2007). The clinical supervision competencies identify those responsibilities and activities that define the work of the clinical supervisor. 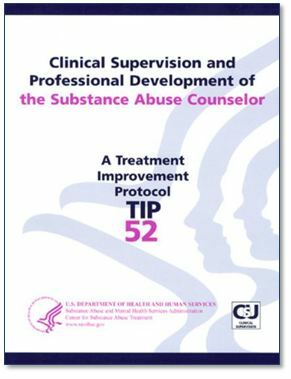 This TIP provides guidelines and tools for the effective delivery of clinical supervision in substance abuse treatment settings. •“Supervision is a disciplined, tutorial process wherein principles are transformed into practical skills, with four overlapping foci: administrative, evaluative, clinical, and supportive” (Powell & Brodsky, 2004, p. 11). “Supervision is an intervention provided by a senior member of a profession to a more junior member or members. . . . This relationship is evaluative, extends over time, and has the simultaneous purposes of enhancing the professional functioning of the more junior per-son(s); monitoring the quality of professional services offered to the clients that she, he, or they see; and serving as a gatekeeper of those who are to enter the particular profession” (Bernard & Goodyear, 2004, p. 8). •Supervision is “a social influence process that occurs over time, in which the supervisor participates with supervisees to ensure quality of clinical care. Effective supervisors observe, mentor, coach, evaluate, inspire, and create an atmosphere that promotes self-motivation, learning, and professional development. They build teams, create cohesion, resolve conflict, and shape agency culture, while attending to ethical and diversity issues in all aspects of the process. Such supervision is key to both quality improvement and the successful implementation of consensus- and evidence-based practices” (CSAT, 2007, p. 3). For hundreds of years, many professions have relied on more senior colleagues to guide less experienced professionals in their crafts. This is a new development in the substance abuse field, as clinical supervision was only recently acknowledged as a discrete process with its own concepts and approaches. •Organizations have an obligation to ensure quality care and quality improvement of all personnel. The first aim of clinical supervision is to ensure quality services and to protect the welfare of clients. •Supervision is the right of all employees and has a direct impact on workforce development and staff and client retention. •You oversee the clinical functions of staff and have a legal and ethical responsibility to ensure quality care to clients, the professional development of counselors, and maintenance of program policies and procedures. •Clinical supervision is how counselors in the field learn. In concert with classroom education, clinical skills are acquired through practice, observation, feedback, and implementation of the recommendations derived from clinical supervision.